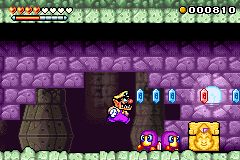 The Jewel Piece Box is an object in the game Wario Land 4. There are four Jewel Piece Boxes in each level. Each box contains a Jewel Piece and a Gold Coin worth 500 points. Upon opening all four boxes, the four Jewel Pieces will join and form a Pyramid Jewel. The Box bears the face of the Golden Diva. The player does not need to find all of the boxes to go to the next level but the player does need all of them to be granted access to the Passage's Boss. The location of the Boxes will move to more hidden locations with the game modes. Once Wario collects the Jewel Piece from the Box, only the Gold Coin will pop out if he revisits the level and opens the box again. When Wario Land 4 was in development, Wario originally needed a Key to unlock the four boxes (much like Wario Land 3) to gain the four Jewel Pieces. In the final game, Wario merely has to touch the box in order to open it. Besides the Keyzer, no other type of key is seen in the game. This page was last edited on June 8, 2018, at 23:32.